PlunderNauts publisher Backflip Studios has announced the launch of Epic Island on iOS devices. The game takes players to the island of an evil sorcerer named Cedric Sparklehands, who has populated his land with minions to challenge adventurers. Players recruit a team of up to five heroes to complete quests and defeat these enemies, earning fame and fortune along the way. The game offers both single player quests and multiplayer components for limitless gameplay. In Epic Island, players start with a single hero and little power, but will grow over time as they defeat enemies, collect loot and so on. Combat takes place automatically, as players are more managers of their heroes, rather than active participants in combat. Each battle takes time to complete (or can be sped up with premium currency), and players receive coins, fame points and other rewards when they’re successful in battle. Battles take place in dungeons, like forests and villages, each with a series of levels that contain more and more enemies. Players need to defeat a certain number of enemies on each level of a dungeon before unlocking the next floor. Since players have access to multiple heroes at once, they can focus all on one dungeon, or split characters up, depending on their skills. Users also receive treasure chests as they complete floors, which can be opened instantly with coins or premium currency, or saved in one’s treasury until they can afford it. As users collect gear, they can visit the blacksmith to improve those items with better stats. This is accomplished by fusing lesser items into the pieces users wish to keep. These lesser items can also be sold for coins. Coins are used to purchase new gear outright from the blacksmith, as well as unlock new portions of the island for exploration. Many of these areas are level-locked. In addition to single-player missions, users can join community events, defeating monsters like Titans that roam the island. Titans have a massive amount of health points, and all players work together to whittle this down over time. Users can choose to dedicate a single hero to this task for 30 minutes to two hours at a time, earning fame and coins in the process. The longer they attack the monster, the more damage they cause, which helps players move up the leaderboard in the event. The higher their position on the leaderboard, the better reward(s) they earn after the event has finished. Another major multiplayer feature is competitive, rather than cooperative, as players can take a hero into the battle arena to fight against other real-world players. Matchmaking sees a list of heroes presented across the bottom of the screen, and players can choose their opponent manually. Battles then take place instantly, and automatically, and players receive rewards including honor points, fame and coins if they win. This arena is limited via an energy system, so players can only complete five battles before waiting for these energy tokens to recharge. The more honor points players earn in each limited time battle event, the better rewards they win. Finally, players can unlock achievements and premium currency rewards for completing specific tasks within the game, and can login to Facebook to leave gifts and notes on their friends’ in-game walls. In addition to its other functions, premium currency is used to unlock three additional heroes, after the two that are given away for free. 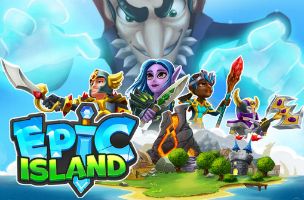 Epic Island is available to download for free on the iTunes App Store.